‘Get in the right mood for Valentine’s Day with the nails of a Vixen with CND Polish in Kiss of Fire. The stunning Kiss of Fire colour comes fresh from the new CND Night Moves collection, a futuristic colour palette full of drama, contrast, shine, and sheen to bring glamour to your seasonal look. Inspired by the overlap of reality and fantasy, dark tones, glitter, and metallic finishes are layered together for a multi-tonal effect. These hot hues are available in both CND SHELLAC Gel Polish and CND Vinylux Long Wear Polish offerings which are both amazingly durable. 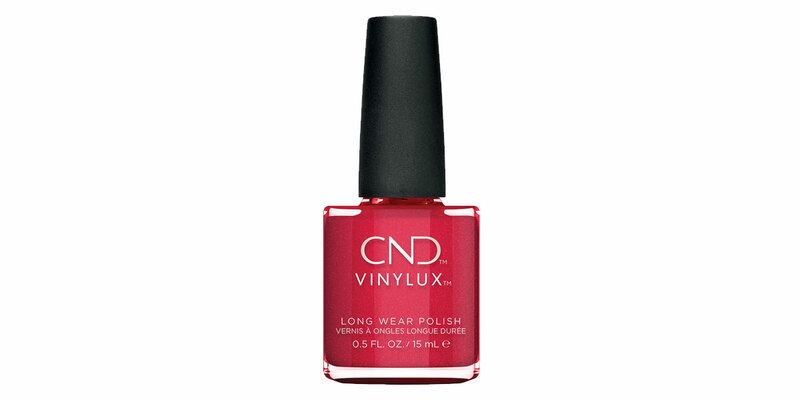 The Vinylux will give you 7-day wear, gel-like shine and fast-drying colour in a simple 2-step application using the CND Vinylux Long Wear Polish Top Coat which features increased durability when exposed to natural light. Price: $19.95 each.